Moving your office to another location is a complex procedure, which requires good planning and efficient timing, especially if you are looking to reduce the overall costs involved in relocating. Using specialised office removal services is one of the suitable and affordable ways to deal with the situation effectively as qualified assistance will go a long way and cover all aspects of the removal process, which means you have less to worry about. One company that can provide you with the right type of service at the right price is Office Removals Feltham – we are an established service provider, and specialise in all types of professional grade office removals and certain commercial relocation services as well. Our aim is to cover all aspects of the removal in a professional, attentive and highly efficient manner and make the relocation swifter and more manageable for our customers and their staff. We will expertly deal with sorting, packing and securing of expensive office equipment and furniture, as we need to ensure safe handling and efficient transportation. Good packing will cancel out the risk of damage during handling and transportation, so we are extra diligent and attentive, when it comes to packing and securing of valuable items and equipment. Our mover teams are made up of specially trained professionals, who have the necessary skills and expertise to handle all stages of your office removal with professional pace and efficiency just as required and expected. If necessary, our guys will even label and list the contents of offices being moved and make unpacking and distributing your items much easier and more efficient. 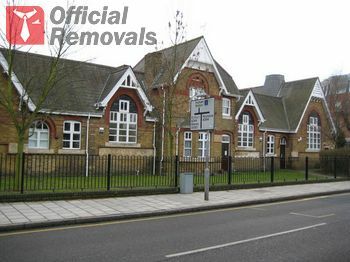 Office Removals Feltham has sufficient technical capacity and will be able to provide customers with flexible and convenient means of transportation and ensure adequate costs. We own and operate a fleet of well maintained, transport vehicles of different payload capacity which means we always have the right van for the job at our disposal. Cost wise, our services are comfortably priced and accessible by all businesses and establishments, our service quotes are fair, and free of any additional, or unmentioned fees and charges. Reasonable prices and incredible discounts. All business relocations tend to generate a certain amount of garbage which you must collect once your move is over. Fortunately for you, we can help you with your waste clearance as we provide comprehensive and affordable rubbish removals in Feltham, TW14. Bear in mind that if you combine our man and van services with our junk disposal options you will able to save some money as you will benefit from our special discounts which will automatically lower furthermore the costs of your commercial relocation. The area is home to several open spaces the most noted of which are Feltham Green and Feltham Park. The latter is the location of the Feltham Assembly Hall a public entertainment venue which was opened in 1965 and used to host shows and concerts on a regular basis. Throughout the years numerous notable people have lived in the area, including legendary musicians Freddie Mercury and Jimmy Page.